Cassava is notorious for its flatulence-inducing property. It also suffers from a lowly reputation as a poor man’s food. Remember the common saying: “Go home and plant kamote?” But did you know that aside from being rich in carbohydrates, cassava may even help lower cholesterol level and may prevent or treat other diseases? Yes, cassava or more commonly known as kamoteng kahoy or balinghoy in the Philippines has other health and nutritional benefits aside from being a starchy food. The cassava, yuca, manioc, or tapioca (Manihot esculenta) is a woody shrub of the Euphorbiaceae (spurge family). It is native to South America where it is extensively cultivated as an annual crop in tropical and subtropical regions for its edible starchy tuberous root and a major source of carbohydrates. Now grown throughout the tropics, including the Philippines, cassava is one of the most important starchy rootcrops, serving as energy source because of its high carbohydrate content. Cassava roots are very rich in starch. Per 100-gram (g) sample, cassava contributes 145 kilocalories (kcal), 35.3 gramscarbohydrate, 1.8 grams dietary fiber, 30 milligrams calcium, 1.1 milligrams iron and 50 milligrams vitamin C. The cassava tuber contains some soluble carbohydrates, like glucose, which can be turned into inverted sugar, thus, conveying a pleasant sweet taste. Inverted sugar is a mixture of glucose and fructose which is obtained by splitting sucrose. It is sweeter and its products tend to remain more moist and are less prone to crystallization. 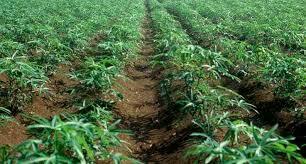 However, cassava is not a good source of high biological value protein. In some parts of Africa and South America, cassava has several uses. 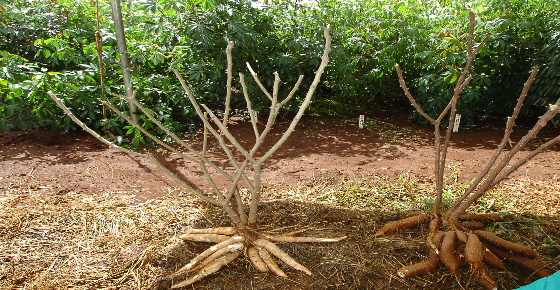 The bitter variety of cassava root is used to treat diarrhea and malaria. Cassava leaves are used to treat hypertension, headache and pain. Cubans commonly use cassava to treat irritable bowel syndrome. Although, caution should be practiced in processing cassava. Raw cassava contains cyanogenic glycoside that when reacted with an enzyme produces hydrocyanic acid (HCN) a toxic substance. This can be eliminated by soaking the cassava in water, rinsing, boiling, baking, peeling or grating. A study by the Food and Nutrition Research Institute of the Department of Science and Technology (FNRI-DOST) showed that cassava caused a significant decrease in the total cholesterol levels and low density lipoprotein cholesterol (LDL-c) levels of volunteer subjects. The study attributed the cholesterol-lowering effect of cassava and other rootcrops to their dietary fiber content. Dietary fiber comes from the family of carbohydrate plant sources that are not digested by intestinal enzymes and are metabolized in the colon. Low dietary fiber intake has been associated with risk to chronic diseases such as obesity, diabetes, cardiovascular diseases and some forms of cancer. Today, with the increased evidence on its nutritional and health benefits and in response to increasing prices of commodities, cassava flour is one of the products recommended to partially substitute wheat in baked and noodle products. Partial substitution can buffer the price of other raw materials, especially wheat flour, and at the same time adding nutritional value to the products. Use of cassava flour in the formulation of different food products will provide consumers with a variety of healthy food choices and will also benefit the cassava industry, particularly the farmers.